SOS Children’s Village Piliyandala is located in the Colombo suburb of the same name, in Colombo District in Sri Lanka’s Western Province. Colombo District is the smallest but most densely populated in the country, with over 2.3 million inhabitants. In 2008, the separatist Liberation Tigers of Tamil Eelam bombed a commuter bus in Piliyandala killing 26 and injuring 64. The bombing came as a particular shock, since the area was normally very peaceful. Much has improved as regards the living conditions of the population in Colombo District in recent years – but much work remains to be done. Life continues to be very unequal in Sri Lanka: the Gini coefficient, which measures household income equality, has increased in recent years, indicating growing inequality. Colombo District also continues to receive the highest number of internal migrants who come to the city in search of a better life. More often than not, they end up living in poverty in one of the city’s many slums. As of June 2012, Sri Lanka is no longer on the United Nations Secretary-General’s “List of Shame”, which lists countries where children are involved in armed conflict. 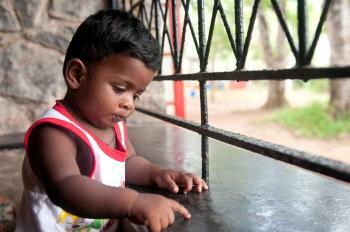 During Sri Lanka’s civil war, thousands of children were recruited by the Tamil rebels to fight. Although the situation has now stabilised, many families remain very vulnerable, and many have been traumatised by the terrible events they witnessed. Today, the SOS Social Centre in Piliyandala provides a family strengthening programme to the local community, which aims to support vulnerable families so that children can grow up in a safe and stable home. We ensure that children have access to basic nutrition, health services and education, for example by providing nutritious meals, textbooks, and extra tuition for the children. To help parents improve their situation, we give guidance on income-generating skills, offer crafts classes for women and we assist them in obtaining micro-loans so that they can become financially independent. Over 570 children benefit from the programme. SOS Children’s Village began its work in Piliyandala in 1981. Care in SOS families: Today, 16 SOS families can provide a loving home for up to 160 children from the region. In each family, the children live with their brothers and sisters, affectionately cared for by their SOS mother. Education: The children go to kindergarten together with children from the neighbourhood, ensuring that they make friends and are integrated into their local community. They then go on to attend the SOS Hermann Gmeiner primary and secondary schools in Piliyandala. Up to 1000 pupils receive a solid educational foundation here, making our schools very important in the region. Support for young people: Once the children reach adolescence they usually move on to the SOS Youth Programme. While they attend higher education or vocational training, they live in one of several shared houses, supervised and guided by a qualified SOS counsellor as they learn to live independently, take responsibility and increasingly make their own decisions. The SOS Youth Facilities in Piliyandala also include workshops for woodwork, metalwork, welding and electronics, and our vocational training centre here prepares future SOS mothers and co-workers for the important roles they will be taking on in caring for children.